E-readers are back with a vengeance, after being declared dead just a few months ago, with new devices expected to hit store shelves in the near future. In the wake of Apple's multipurpose iPad, not to mention the coming onslaught of tablet devices, many figured the single-purpose e-reader-largely, but not solely, defined as models E-Ink--was finished. Fast forward to August and the e-reader price war is getting red hot, brand new Kindle devices from Amazon just hit the market, and more new e-readers (both real and rumored) are expected very soon. 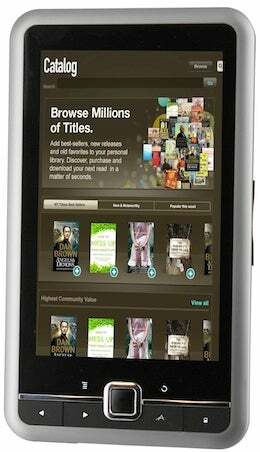 So what's next for the world of e-readers? Let's take a look. The Literati by The Sharper Image falls into the tablet-focused-as-e-reader category. 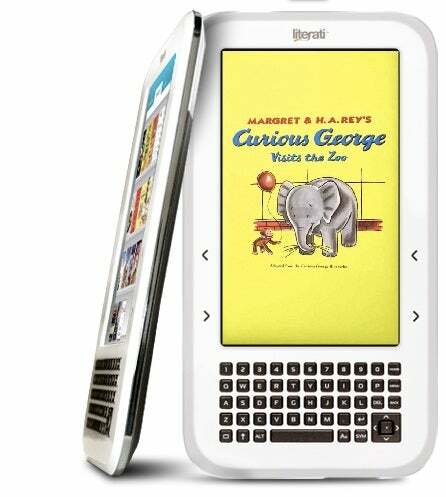 The Literati features a 7-inch full-color LCD display, Wi-Fi connectivity, and access from the unit to the Kobo bookstore. The unit comes in black and white, sells for $159 and is due out in October. Although the Literati carries The Sharper Image brand, it is actually produced by a company called MerchSource that licensed The Sharper Image name. You also get a bunch of freebies with the Literati including 150 free classic books such as the Adventures of Huckleberry Finn. It should be noted, however, that most e-reader bookstores including Apple's iBookstore, Google Books and Amazon's Kindle Store offer access to similar free titles. E-reader manufacturer Pocketbook, headquartered in Kiev, Ukraine and Overland Park,KS, plans on launching five new devices during the IFA Berlin trade fare in early September, and will be available in the U.S. market in October (pricing will be announced September 3 at IFA). The units will be available online, and the company is working to distribute its products via Ingram Micro. 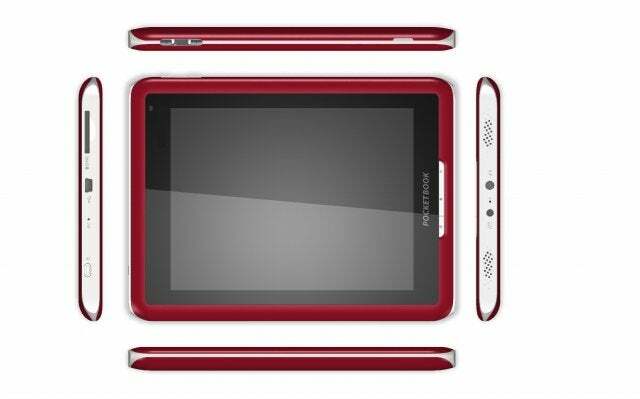 The Pocketbook 602 Pro and 902 Pro have 6- and 9.7-inch screens respectively, Wi-Fi and Bluetooth connectivity, 2GB of storage and both are powered by Linux. The Pocketbook 603 Pro and 903 Pro are sporting similar screen sizes, firmware and storage capacity as their 602/902 counterparts. The e-readers have E-Ink Pearl displays, according to the company, and then have a touchscreen overlay by Wacom (stylus included), and 3G connectivity in addition to Wi-Fi and Bluetooth. On-board bookstore access will be provided via Bookland.net. Finally, the Pocketbook IQ will be based on Android 2.0 (eclair), have a 7-inch color TFT touchscreen, 2GB of internal storage, and Wi-Fi and Bluetooth connectivity. The company says it can be used as a multifunction device, for activities like e-mail, but could not confirm whether the Android Market will be accessible via the device. The on-board bookstore will also be Bookland.net. DMC Worldwide has been showing off its Copia e-readers since the Consumer Electronics Show in January, but the devices have yet to become available. That may change soon as a $99 Copia e-reader with a 5-inch screen is set to go on sale this fall, according to The Wall Street Journal. It's unclear what the specs for the device will be or exactly when it will launch, but Mashable says the device will have a 2GB of internal storage and a color LCD display. Copia readers will also include social networking integration with Twitter, Facebook and Goodreads allowing you to show off what you are reading on your Copia device and discuss your favorite books with your friends. This is still in the realm of rumor, but Sony is believed to be launching two new Sony Reader models very soon, according to Engadget. The rumored PRS-350 would be a 5-inch device and replace the current version of the Reader Pocket Edition. The equally mythical PRS-650 would replace the current Reader Touch Edition and feature a 6-inch display. 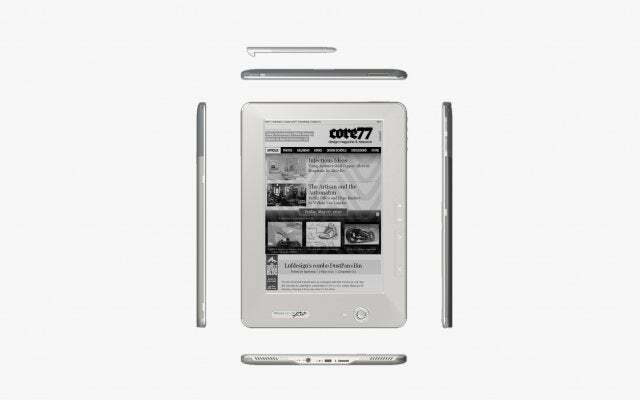 Both devices are believed to be sporting e-ink touchscreens, 2GB of internal memory and a 0.40-inch profile. Other rumors suggest the PRS-350 wouldn't have any wireless connectivity, while the 650 may include 3G as well as Wi-Fi. You may soon be able to get your hands on a color e-reader display that more closely mimics the printed page. One of the complaints against current versions of e-paper, such as the E-ink displays in the Kindle and Sony's Reader, is that e-paper can only display grayscale images and text. LG may be about to change that, however, after the electronics maker's recent announcement that it plans to produce color e-paper in the very near future. LG's new e-paper would come in 9.7- and 19-inch display sizes and would be flexible, similar to the cancelled Que reader device from Plastic Logic. LG's is not new to the e-paper game, as its displays are already found in a variety of e-readers including the plus-sized Kindle DX. 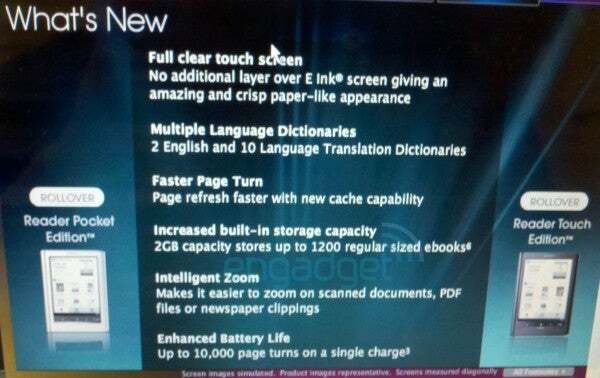 So there you have it, the latest devices and technologies that point to the future of the e-reader. There may be a wave of multi-function tablet devices coming soon, but it looks like single-purposed e-readers are still going strong. Well, at least for the foreseeable future anyway.